Oh, but the Mormon world has exploded this past week. What began as a fairly simple movement has turned into some shocking drama. I know all people are prone to over reactions, but I feel like as Mormons we excel at this. I think it’s a part of our mythology. Joanna Brooks hit on this in her book, Book of Mormon Girl. The Mormon pioneers would “circle their wagons” as to protect themselves from danger. Mormons have been through such periods of persecution throughout history, that we’ve always learned to “circle our wagons”. And we tend to do it en force when someone is threatening our way of life… even if it is just a perceived threat, I should add. But what do we do when the threat comes from inside the church? Well, we still circle the wagons, we just leave some of our own members on the outside of the circle. 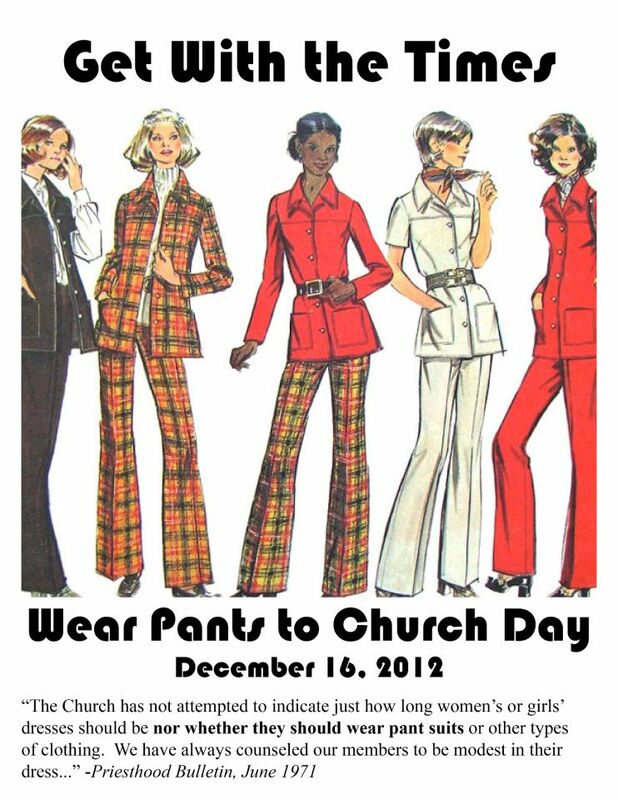 It began when a group of women, All Enlisted, decided to organize a “Wear Your Pants to Church Day”. First let me start off by saying that it was not about the pants. They were a symbol. But even still, a lot of people didn’t grasp the concept of the pants. The church has no rules about women wearing dresses to church. In fact, they released a statement this week saying, “Generally church members are encouraged to wear their best clothing as a sign of respect for the Savior, but we don’t counsel people beyond that.” It was never about what the church allowed. It was about what the body of the church considered normal. The social norm, if you will. When I posted about this on facebook (and oh my gosh, the reaction I got) several people just had to let me know that several women in their wards wear pants to church, and no one cares. Sure. Except that in every ward I’ve ever been in, there were only one or two women who wore pants, and they were different. They were an “other”. Of course they weren’t kicked out. Of course everyone was kind. Lots of Mormons are jerks, but we all seem to know enough to not be so blatantly. But, if you argue that the women in your ward who wear pants are just like all of the other mainstream Mormon women in your ward, I will call you a liar. Now listen, it may be true in some wards sometimes—wards all have their own unique cultures, and some of them ARE more progressive than others (I just blew some Mormon minds with that. We like to tell ourselves the church is THE SAME everywhere. )—but the social norm is, and has been, that women wear dresses or skirts to church. Challenging that norm puts you on the outside. Period. And please, the whole idea that women look their best in dresses stems from the good old days when women were considered indecent unless they were swathed in clothing (is that your ankle showing?!?!). The norm in and of itself is steeped in gender bias. And that gets us to what was really at the heart of the matter. It was really a movement about women’s issues. It was a movement about gender inequality. It was just a way that these women felt they could invite some inclusion. Those of us who struggle with gender inequality in the church often feel like we’re on the outside. When we try to force our concerns, the wagons get circled against us. Just in the 24 hours after I posted to facebook about wear your pants to church day I was told (either directly or indirectly—cause you know how some people don’t have the courage to say something straight to you, so instead they do a status about it and pretend it’s a general thought. Some people did have the courage though.) I was told I was disrespectful. I was told I need to reevaluate the reasons that I go to church. I was also told that my point of view has no place in sacrament meeting. I was told that there are bigger problems in the world—greater gender inequality outside of the US, which I obviously had no concept of—and so I just sound whiney when I bring up my own issues. I was told I didn’t understand the gospel, that my testimony just wasn’t strong enough, and that I needed to pray about the role of the priesthood in the church so that I can gain a real testimony of it. But none of that applies to me. Wearing pants to church on Sunday would not be disrespectful. I do not need to reevaluate why I go, or be reminded that church is a place for worship. I think people were saying this because the whole “Wear Pants to Church Sunday” thing was being called a protest. And maybe people were envisioning droves of angry shouting women storming the church with picket signs… I’m just not sure. They think that this whole thing is going to detract from the sacred purpose of our meetings, which are meant for worship. But really, they’ve got it all wrong. It wasn’t really a protest, especially not one against the church. It was more about awareness. It was more about raising the white flag to women who struggle with gender inequality and letting them know they are not alone. It was about extending the invite to come and worship, and to not be afraid to be outside of the mainstream. It was really a message of hope and peace for those who have felt silenced and ignored. If you must call it a protest, please think of it as a Gandhi type protest. A silent, peaceful one. One that was really just meant to begat more peace. And if you feel like the whole detracts from your ability to worship on Sunday, it convinces me all the more that it needs to be done. Because, really, we should give you an opportunity to examine in yourself why exactly that is. Because you make me feel like an outsider when you tell me my point of view does not belong in sacrament meeting, and that is the opposite of what the Savior has taught us about worship. And I know there are bigger problems in the world. Anyone who knows me, knows that global gender issues is something that I get really passionate about. But, as I said to someone earlier this week, you don’t ignore brakes that have gone out just because you’re having engine trouble. And perhaps I’m an idealist, but I believe that the more we address these issues in countries where we can, the more influence we can have on the rest of the world. Besides, someone else’s pain—even if it is greater than mine—doesn’t negate my pain. And its unfair of you to tell me that I can’t address my problems just because other people have problems too. It’s just another way to silence me, and I’ve already had a lifetime of that. I do understand the gospel. I love it. I love it’s principles and I live by them. I have dedicated time, so much time, to reading and studying the scriptures… and reading and studying books about the scriptures. I do understand and know the gospel and I do have a testimony of it. It’s insulting that you would imply otherwise. Now, I will give you a moment to examine your moral superiority. …. Done? Let me explain something. While I believe the gospel is true, that doesn’t mean that I believe the church, an organization made up of imperfect people, always functions perfectly. I am capable of separating our culture from our doctrine. Are you? Because if I question something that the church does functionally, it does NOT mean that I am doubting the doctrine. The way the church functions is NOT always a matter of revelation. It is often a matter of culture. We, as a church, need to recognize that. We need to let go of the idea that because the gospel is perfect, so is the church. I mean, really, would you being saying that before the 70s when women weren’t allowed to pray in sacrament meeting? You can’t pretend that the church has never made changes on these issues. Of course, you might be telling yourself that the that change happened in the Lord’s time through revelation… and not actually in response to women who were complaining about the unfairness of it, which is the truth. Will it help you if I tell you I believe those women were inspired to complain about it? No? I also don’t need to be lectured about the priesthood. I believe the priesthood to be the power of God here on earth. And I believe that it blesses men and women equally. And, quite frankly, women holding priesthood office is not really an issue for me. I sympathize with women who struggle with it. Especially in regards to the differences in ordinances that women are allowed to participate within and without the temple. It can be confusing to define our role as priestesses. But still, for me it is not really an issue. And you condescend to me when you assume that because I have issues with gender inequality in the church, I struggle with priesthood authority. I wish that women were invited to pray in general conference, and that there were more women speakers (with longer speaking times) in general conference. I wish that young women and young men/scouting budgets were equal. In fact, I wish that women were involved in the church’s finances at any level at all. I wish that young women weren’t taught that they need to dress modestly to protect the young men from having impure thoughts, and conversely I don’t want my sons to ever be taught that if they have an impure thought that it is the woman’s fault. I wish that I didn’t have to specifically request that my tithes and offerings be separated on the records from my husband’s. I want to make my offerings to the Lord myself, and don’t know why I should ever have to explain that. I wish that we were all more comfortable talking about Heavenly Mother. We’ve been instructed that it is inappropriate to pray to Her, but that doesn’t mean we should pretend She doesn’t matter. We also don’t pray to Jesus, but we talk about Him, and our relationships with Him, an awful lot. As women, She is who we hope to become, it’s too bad we often are shamed out of discussing Her. Look at how none of these things have anything to do with the priesthood. For the sake of clarity, this list is not inclusive. But if I went on and on you might get bored, and you’d still not find anything that has anything to do with priesthood authority, or that goes against church doctrine at all. The fact is that our church was established within a society and culture that was fairly misogynistic. And, as such, our church culture bears the resemblance of that. Society has changed and continues to progress. I don’t think that I am out of line in requesting the same from my church culture. I was actually told this week that people in my ward care about me, that when I bring politics into church it makes them uncomfortable. Well, my first problem is that you see these things as “liberal politics” (which I don’t. I don’t see these issues as being political at all.) then I have to call the rest of you out on spouting lots of “conservative politics” in church all of the time. Which makes me uncomfortable all of the time. My second, and more prominent, problem is that the basic message here is that people care about me, but are uncomfortable being around me unless I keep my mouth shut. Never felt like more of an outsider in all my life. Nonetheless. I wore pants on wear your pants to church day. I was scared. I’d been led to believe that it was going to be a point of contention. And I was going in alone because my husband and kids stayed home sick. (My husband had planned to wear a purple tie in support – something a lot of men were doing.) I’m happy to say that no one was overtly hostile. Only one sister barely suppressed a sneer when she looked at me. A few people refused to make eye contact. Everyone else I interacted with was perfectly fine. I feel stronger, though. Like I’ve “come out” as the Mormon feminist I am. It was liberating. I’m proud of you for doing it, Leah! Good job! What a thoughtful response to all of the ridiculousness this week. Thank you for your perspective! Brilliant post! A great articulate summing up of issues that resonate deeply with me. Thank you for sharing your thoughts so eloquently. Is it wrong to abide by social norms? Is it wrong if we comfortably go along with social norms outside of the church but take offense to any social norm that may be accepted in the LDS church? Social norms for acceptable dress codes are not set by the LDS church. Those norms are set by a mixture of work environments, geographic locations, social groups, cities, ethnicities, governments, etc. Members in other countries dress in attire deemed appropriate for the culture in which they reside. In the US, the norm is that a skirt or dress is a step up from wearing pants. This is generally recognized when you attend a theatrical performance, go for a job interview, or attend a “classy” function. Most willingly embrace norms to some extent. The next time you walk down the sidewalk, notice how nice it is that everyone knows to step to the right. In the US, we wait obediently in line for the next available cashier. We speak of distance in terms of time rather than distance (ie. How far is it to the church? About 10 minutes). There are always people who go against the norm (either intentionally or not). Those who wear jeans to a job interview or a tuxedo t-shirt to the theatre. It shouldn’t be surprising or offensive that in the LDS faith we take into cosideration cultural norms in dress code. And I believe it’s wise to set guidelines. When attending church, we are asked to wear our nicest clothes. Personally, I can’t justify kakis and a golf shirt because I know I have other outfits that are widely accepted as being dressier. If I were attending a wedding (regardless of religion) I would adhere to the cultural norms and wear a suit. I’m okay doing the same when I worship. Are following social norms always a bad thing? No. Is it wrong to question a social norm? Absolutely not. If so men would still own slaves. Women wouldn’t, of course, because they would not be allowed to own any property at all. There is a big difference between the other social norms you mentioned and the social norms I challenged on Sunday. I have no problem walking to the right on the sidewalk. That’s a harmless social norm, and in fact quite useful. It is also no respecter of persons. The social norm that says that women only look their best in dresses is steeped in gender bias. As I mentioned in the post, it has a historical precedent. The idea was that women were indecent in pants – it showed the curve of their hips and the shape of their legs!! Ironically, women show of way more of their bodies in dresses/skirts these days than they do in pants. Nonetheless, the standard remains for many. But the fact is that I don’t always wear a dress or skirt to work/interviews/weddings. 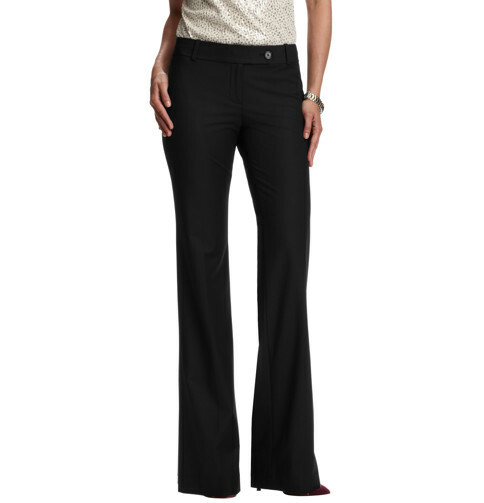 I more often will choose nice dress pants with a nice sweater or blouse. And that is not uncommon for most women in Western culture! In fact, those ARE some of the nicest clothes I own. So, if the standard is to wear our best to church, I should always being wearing pants. So this social norm isn’t very useful. And is potentially harmful. And please remember that the pants were really just a symbol of the dialogue we really wanted to begin. There are other social norms that I believe are counterproductive, as well as potentially harmful. That is the heart of the matter. all organizations have room for improvement as they pursue an evolutionary path of betterment. Study a little church history, i.e. the church during Pres. B. Young vs today’s church. Maybe a bit of patience and insight as to the difficulties and challenges associated with the types of “inequalities’ you perceive would help ease your burden of want. Unfortunately, when we take it upon ourselves to utilize our individuality in ways that invite contention, rebellion, or other counterproductive means, we only diminish our personal integrity. A close review of Christs instruction regarding pride unmasks the pretender. John, I would argue that the personal integrity of the women who participated n this was only strengthened. Interestingly enough I think the personal integrity of many of the members who fought against this event has been diminished. The only contention that surrounded this event came from members who decided to take upon themselves “the sword of truth” and go on the attack, questioning the worthiness of the participants, name calling, telling them to leave the church, and much more. If we are looking an integrity issue the participants showed great integrity. The counter productive means were shown by those fighting against it when they failed to follow the second greatest commandment which is to love our neighbor. They were counterproductive when they found it more important to judge others and treat them as anything less than equal members of the church. They were counterproductive when they ignored the savior’s teaching to leave the 99 and seek after the 1. Many of these who participated consider themselves to some degree or another “the 1.” We have heard so much about “the rescue” and yet at a time when so many cold have taken this opportunity to simply show love they chose to attack and degrade and shame. They were counterproductive when they ignored the teachings in mosiah 18:8-10….to comfort those that stand in need of comfort, to mourn with those that mourn. The time to criticize those who participated. The time has come to reach out to those that do in fact feel marginalized and help them to feel like they are wanted, like they have a place in church, our bishop gave such a wonderful talk several months ago about acceptance of those that may not be on the same place in the faith spectrum. He was very clear that no matter where we find ourselves on that spectrum we are all loved, welcomed, and needed at church. It’s time for us to show that we truly believe what bishop taught. I choose to stand shoulder to shoulder with all my friends. Am I to be the pretender in this scenario? I assure you that I am not. I am not driven by my pride, but by my conscience. I wrestle with these issues. And I think that if you knew how frequently and sincerely I have taken these things to the Lord in prayer, you would not condescend to me they way you have here. If church history has taught me anything (and it has taught me very much) it is that changes have often happened within the church because its people have petitioned for it. It is not about “being an individual”. Nor do I think it would even be appropriate to blindly “serve the organization by upholding its standards”. If we all did that, society would *never* progress. And I’m not even impatient about the changes. I don’t expect anything to happen over night. I’m very aware – probably more so than you are, since I’m often vexed with the issues – of the challenges that come with addressing these inequalities. That does not mean they should not be addressed! Nor do I believe that we have invited contention or rebellion. I still maintain that this was a measure of love, worship, and acceptance. If you felt otherwise, it was through your own lens. I know that the organizers of the movement – and all of the people who I know who participated in it – did it with love for the church and the desire for everyone to feel that love. Thanks for this post. I think this gets closer to articulating my feelings on this issue more than any other post I’ve read over the last week, and I’ve read plenty of them. I, like you, don’t advocate for women to have the priesthood. I truly believe in the scriptures and the Spirit and all the good things in the gospel. But I’m also troubled by gender equality issues–not because I think women need more power or recognition per se, but because I believe the Lord speaks to both men and women, and when we focus on the priesthood and suppress or ignore the spiritual contributions of women, it denies us the chance to learn from other people to the extent that we could. I guess what I’m trying to say is that I appreciate the acknowledgment that you might not agree with a policy or an interpretation of something, AND you can still believe. For me, it’s not an all-or-nothing proposition. I believe in the priesthood, I love the gospel, I am a SAHM who enjoys that role most of the time, I have a great relationship with my husband, and I’m a feminist. Thank you for this! The way that we couple revelation with priesthood is something else I do wish we would bring into the dialogue. The contribution of women’s spirituality IS often downplayed! (How are often are we consoled by being told that we receive revelation for our children? As thought that were the extent of it!) Thanks for adding this to the discussion. This posting did a great job of explaining in detail why this issue was so important to so many women (and men). I am grateful that I was able to support all of these women that I call my friends. Too many people cannot see beyond the “pants” and the symbolic nature of this event. I am proud of all those who were willing to buck cultural norms and stand together in solidarity with each other. Wonderful! Like KK mentions above, this post really sums up my feelings about this last week. I did wear pants but I avoided any mention of it on my FB page until after church and all I did at that point was post a photo. I just couldn’t deal with negativity I was seeing everywhere. I’m so frustrated with the repeated comments on every blog post and the Event page about how this was a protest and not appropriate for Sacrament meeting. I feel like I would know when I was involved in a protest and frankly there are lots of things not appropriate for Sacrament meetings that happen quite frequently. I mean if we want to talk about personal forums, please come to F&T meeting one day and hear what passes for a testimony!?! I realize I sound rather grumpy but I’m so extremely frustrated with the misunderstanding and the absolute hostility surrounding this event. To me, it was a beautiful moment of solidarity with others who share some of my same struggles and concerns. And the event gave me the most wonderful opportunity to talk to my daughters and explain why I would be wearing pants. It was such a touching and bonding moment for us and I’ll cherish it forever. On the way to church I was beyond nervous but once I sat down (comfortably in the freezing chapel in my warm wool pants) I felt a wave of calm surround me. I loved every moment of our meetings that day (and that is not something I have said in a very long time). Did I get some disapproving looks? Yes, but that is okay, I understand. I left church having felt the spirit, feeling peaceful and empowered. I consider that a pretty darn good Sunday. Thank you for sharing your experience here. My heart is warmed to know that you were able to share this with your daughters! Such a wonderful thing. I don’t know how many members of the Church are there? Millions? How many folks took part in this mourning either by joining or resisting? When you open an article with “the Mormon world has exploded this past week” well for me, it’s hard to take it seriously, seriously, just saying. It makes for sensational headlines I guess. Doesn’t sound like this was a positive experience for anyone, hope we all learned something from it, hope we can all get along better in the future. Kathy, this was a actually a very positive experience for me. And if you go to feministmormonhousewives.org, where people have poured in their experiences and photos, you will see that it was an overwhelmingly positive experience for mostly everyone involved. Your assessment is just not accurate. Although, I do also certainly hope that we have all learned from it. That was the point! And I certainly didn’t mean to sensationalize the issue. But, the fact is that this movement has been picked up by many news organizations from all around the world. I would encourage you not to be dismissive of it by downplaying its popularity. It is actually quite a big deal. I agree,it was great to be part of this movement and I really appreciate your excellent summation. I have been misjudged again; Well of course the news papers globally picked it up, come on everybody the Morman girls are having a cat fight!!!! This event decided that it’s cause was for the greater good (and I agree) This event found that if some people’s feelings were hurt (which inded they were on both sides equally I feel) that would be O.K. for the greater good. Come on……isn’t that what this whole thing was about? This event did the very, very thing that it was questioning. just saying. my opinion. I am not downplaying this event. Oh and I couldn’t figure out where the mormon girls were circling their wagons, then you pointed me to it at feministmormonhousewives.org, glorious to see 🙂 Love it! It’s so good to see the young people thinking they have invented something new. I am so happy to see it really. First, I am sorry that so many were harsh and judgmental. That is not Christlike at all. The struggle I have with what happened on Sunday goes beyond equality. I am all for women’s rights. I have suffered inequality, but personally choose to react differently to it. When associating yourself with “All Enlisted” you also associate yourself with their objectives. This was a start of what they, in the long run, desire to do. (http://pastebin.com/jYVgKyNw) They go against the Prophet. Against the Lord. They are trying to change the Lords church on their time. The Lord does things in His time, not our time. I also think that these issues and feelings of wrong-doing should be taken up with your Savior, not publicly aired in a meeting where sacred ordinances are being performed. If you look at the objectives this group has in mind, it falls under Anti material. They are wolves in sheep’s clothing, if you will, and I would encourage anyone to be very carful how caught up in this group they get. It is NOT in line with the doctrines of the church or the will of the Lord. My heart aches that these women have harbored this for so long that it has come to these extremes. That said, From Elder Bruce C. Hafen: “We cannot really feel charity—Christ’s love for others—without at least tasting His suffering for others, because the love and the suffering are but two sides of a single reality. When we really are afflicted in the afflictions of other people, we may enter “the fellowship of his sufferings” enough to become joint-heirs with Him.” May all these women find peace in and through our Savior who sacrificed for us so that we can overcome these types of things through Him. Thank you for saying exactly what was in my heart. I have sent a link for this article to my friends and family so they can better understand me. Bless you my sweet sister. Is she out here soliciting financial donations for this group? No!! She is stating her open honest opinion and feelings about the vile and hateful reactions this has solicited from her fellow sisters in the gospel. Simply because she is saying, “Wait! I agree with some of these issues.” Put your “Sword of Truth” away and listen to what she is saying. There is a whole scale of feminist issues that bare actual valid responses that don’t go anywhere near the priesthood hot button. Listen, just LISTEN. I currently have a tree in my house that is representative of the winter solstice. Yet when I look at it I don’t think of the winter solstice, I think of an evergreen tree representative of the life of Christ. I suppose my challenge is that I don’t look at a dress and see 150 years of oppressive male dominance, I just see a nice outfit. I know there are people who believe Christmas decorations detract from the real meaning of Christmas, and allowing your children to believe in Santa is heresy… I simply enjoy a season where people are friendly and give gifts to one another. I honestly don’t care whether a woman wears a skirt or pants to church (I was trying to think if anyone participated in the “rebellion” from our Ward, but I have no idea… because I don’t check out what people wear). But I’m also a long way from believing that women who feel more appropriate wearing a dress are being harmed. Not everyone views the current state from a historical lens of how we got to this point. Some see winter solstice and oppression. I see Christmas and a nice outfit. Again your comparisons are a bit flawed. The pine doesn’t care what you call it or how you see it. Many women do care what your perception is about what they wear. Not all do. Some prefer dresses. Nor did I ever say that a woman who feels more comfortable in a dress is necessarily being harmed. I want women to do what they want. The problem with the perception that “dress is best” is that it can be harmful to women who prefer pants, which is outside of the social norm we discussed. And, again, this is not really about pants. We need to stop talking about pants. The whole point was to start a dialogue about the bigger picture of gender inequalities. Said an overly sensitive feminist? Come on, a person can’t talk about inclusion and equality and then discount an opinion simply because of gender (ie. “said a man”) can he/she? Flawed as my comparison may be, I think you may have missed what it was. At some point, a cultural norm isn’t about thousands of years of history, its about what the norm has come to mean to the hear an now. Perhaps I just haven’t been exposed to a lot of women who feel oppressed. in the spirit of full disclosure, i must admit that i think this whole “pants” thing is a lot of progressive nonsense. that being said, i would like to offer a few observations, and then i do have a very sincere question that i welcome any answers to. first: the heart of the gospel, indeed the very substance of the gospel is conformity, not equality. think about that for a moment. i do not know what the lady’s name is who started this whole thing, but i would dare say that she is much closer to being excommunicated than she is to changing any of the church’s policies or doctrines. in her pursuit of the hypothetical and trivial, she may find that she has created a situation for herself that is very real and serious. second: while it is a little saddening that a topic of this caliber has raised so much attention, i am grateful to live in a time and place that we have not only the freedom, but also enjoy the other luxuries that allow us to participate in a debate of this nature. god bless america. third: men and women are not the same. we aren’t supposed to be the same. different does not mean unequal. now for my question, would the supporters of this movement, or whatever it is, like to to see this same so-called gender equality mindset apply to the temple clothes? and if the temple clothes, what about the endowment ceremony itself? would we all veil our faces, or none of us? would we all sit together? and if so, who would the officiator look at during the gender specific dialog? One: I fundamentally disagree with this. Joseph Smith was not remotely about conformity or our church would not exist/have been restored. Men and women aren’t the same. Of course not. One man and another man aren’t the same. One woman and another woman aren’t the same. Everybody should be treated like individuals. Forget the gender! Forget the race! Let them be themselves. Thanks for the great post. I am astounded that this simple act has prompted such a negative backlash. Pants are this controversial? Is this 2012 or 1812??? I remember years ago sitting as a counselor in a young women’s meeting. One of the other counselors was giving a lesson and told the girls about how she immediately quit college as soon as she got married because the Lord wanted her to take care of her husband instead. I remember thinking, “What kind of dim bulb was this guy to not be able to figure out how to microwave his own dinner while his wife was finishing the two classes she needed to graduate?” The point is not whether or not this individual chose to quit school, because that’s a personal choice. The point is that this was being taught to the young women in this class as “the right thing to do.” I wanted so much to let those girls know that this was not the only option, but I was so afraid of being called out and chastised as an unbeliever that I remained quiet. This was 20 years ago and I still regret it to this day. I applaud the women who stood up and tried to draw attention to this important issue of equality. the gospel isn’t joseph’s. the plan of salvation and the gospel, (the atonement) is god the father’s and the savior’s. it began in the very beginning with jehovah and two thirds of gods children conforming. (didn’t work out so well for the other third) it continued in the garden of gethsemane when the savior conformed to the will of the father. all of the rights and ordinances of the priesthood are accessed through conformity. they have been since the beginning. this has been the case in every dispensation of time. there can be no compromise in the covenants we enter into with god. he sets the parameters, then we choose to conform or not. has your stake president ever offered to let you skip any of the temple recommend questions? it is through conformity that we can achieve equality. please don’t be offended, but you are wrong about joseph smith. through very painful experience joseph learned that it was only through conformity that he could help bring about the purposes of god and ensure his own salvation. it is not that he “was not remotely about conformity” as you said, but rather that he learned who and what he needed to conform to. you may recall, that just prior to his first vision, he stated that he had some desire to be united with the methodist sect. i think it is a very fair to say that the methodists of the early nineteenth century required conformity. evidently, even in the years before the lord revealed the truths of the gospel to him, conformity was not something he was apposed to. years after the painful lesson learned about conformity from the loss of the 116 pages of manuscript, joseph again found himself pitted against conforming to the desires of man or god, when the doctrine, now contained in the 132nd section of the doctrine and covenants was first revealed to him. the required conformity to this doctrine caused many others to apostatize. joseph smith was more than “remotely about conformity”. i do not consider you silly. but i do wonder if you have honestly considered “the end game” as you put it. in the temple we should be learning something more than the petty squabbles the world has to offer. the genders are different. they were never intended to be the same, in role or function. but different is not synonymous with unequal. think of the words of the sealing ordinance. each (gender) is wonderfully different and each is required, for it is upon the unit, the union of the two, the sealing blessing is pronounced. think of the words in “the family” a proclamation to the world, gender is a key factor in the plan of salvation for the individual. all this being said, it was a sincere question, and i would enjoy hearing someones answer. Man you are all over this blog. I can tell you have a lot of thoughts pertaining to Mormonism. My brothers and I would like you to write a blog post for us. When you come up with a topic or topics, let us know by clicking on the “contact” button on the home page. The temple ceremony has changed a lot over the years to exclude offensive language and actions. The sexist language can change. My opinion, it’s all symbolic. The women represent the Church, the men represent Christ. But only in the temple. They leave the temple, and there’s no more symbolism. Both the man and woman are the head of the home. Both preside equally over the home. I like your thoughts. My brothers and I would like you to write a blog post for us please. Think about it and when you come up with an idea, sent us a correspondence by clicking on the “contact” button on our home pate. I would say that you have an unparalleled gift for reading an awful lot into a single sentence. Of course, most of your article does not address any reasonable comments that may have been made to you- only the negative that you were already expecting. There were a few sisters in the ward I attended who wore pants, and I DID NOT even notice. The women I talked to didn’t notice and I only found out when friends posted on facebook about wearing pants. None of what I read here inspired peace. This feels more like an emotional response and not a message of enlightenment. To be spiritually uplifted is a mission of the Church- perfecting the saints. None of this is leading me to perfection. You are right that there are issues that need to be addresses. Absolutely. I dont even have a “but” statement to follow. I just want to feel uplifted. Its just not here. I feel bad that you are surrounded by people who make you feel the way you do. Are you even sure about that? I mean I know a few people like that, but really? You are distracted this much by it? You come down on people being distracted by pants- you sound pprrrreeetty distracted yourself. Take some of your own advise. Look inwards. Man, my response is just as good as yours. I dont feel uplifted- this was just an emotional response. I’m looking for the good in it all, the balance (that does exist). Leah. I loved everything you had to say. I have oft thought of these things and they have troubled me as well. I’m glad to know I haven’t been alone in thinking, wondering, or being bothered by these things. My husband thought the whole movement was overboard and that it was actually about something else that would wind up have the exact opposite effect of what they intended. When he asked me how I felt about it, I agreed that I had a problem with the unspoken expectation that a woman had to wear a dress or a skirt. That only those things are our “best clothes”. It’s all essentially cultural and time-period based, and it’s bothersome. I mean, at some point, men and women were both wearing the same things…robes. Why can’t we both wear the same thing again? Pants! (It’s so annoying when your child suddenly lifts up your skirt in church to poke their head underneath a “tent” and you and your underthings are exposed). Of course, my husband told me he didn’t care if I decided to wear pants and that I could do it if I wanted to. I love him for it, but I’m afraid of the backlash or thoughts of others (upon both of us). However, I am slowly but surely coming to a place where I also kinda don’t care what others think either. It’s too exhausting and has nothing to do with my personal relationship with my Savior, nor how well I incorporate and execute the gospel in my life.